You think a pair is cute - you should see them in a flock! 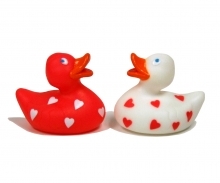 These miniature ducks are also available as a single pair for $4.50, but by packing them together to mail as one flock of 10, we can offer this deal, which is something to quack about: 5 pairs, 10 ducks (a pair is one white with red hearts, one red with white hearts) for $12.00 (comes out to $1.20 each). Don't let their size fool you (1.5 inch by 1.5 inch), they are full of love and will surely make you and your sweetie smile. $12.00 for 5 pairs, 10 ducks.